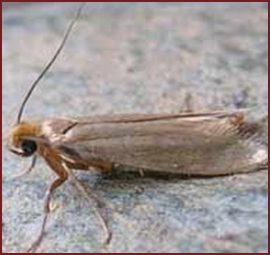 The Casemaking Clothes Moth is less common than the Webbing Clothes Moth. Casemaking moths are smaller, at around 1/8 to 1/4 inch. They spin a casing or tube from silk. The casing provides protection in times of danger. Both the webbing and casemaking clothes moths are controlled in the same way. 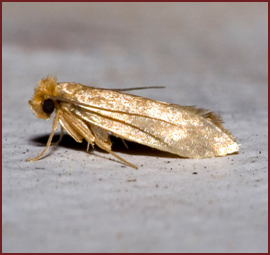 The Webbing Clothes Moth is said to be the most common variety of fabric pests. These pests are notorious for feeding on clothing and natural fibers. They have the ability to turn keratin, a protein present in hair and wool, into food. Clothes moths prefer dirty fabric and are particularly attracted to carpeting and clothing that contain human sweat or other liquids. They are attracted to these fabrics for the moisture as the larval stage does not consume water. 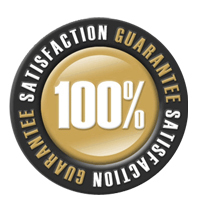 • Vacuum upholstery, rugs or carpeting. • Use naphthalene balls (moth balls) to store fabrics. • Brush and/or dry clean clothing.